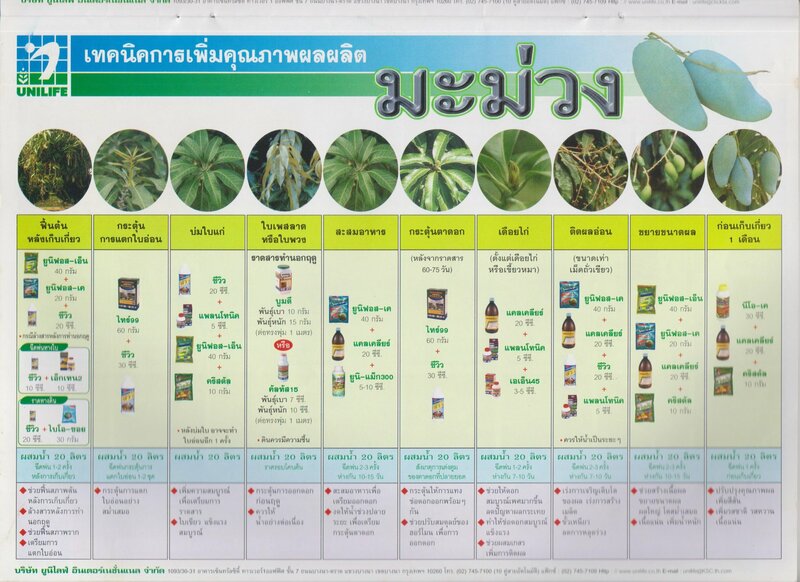 We are going to be planting over 50 rai of mango in May. We have some friends who own mango orchards, so we we are getting some advice from them, and I have been studying up on it. We are considering using the methods being pioneered in Ghana right now, by planting the trees closer together (4-5 meters apart, in a row) instead of the traditional six meters, and doing extensive pruning, to keep the canopies relatively small. It is supposed to produce high quality fruit, and I hear it is easier and more productive. Do any forum members with experience growing mangoes, have any feedback? Also considering a small amount of durian and jackfruit, but mostly mango. This is for commercial sale purposes. Thanks. Member BSJ is surrounded by mango orchids. When you say for commercial sales do you mean on a contract. Lots of Lamyai here but only a few mango trees here and there. We were also down the road from a huge fruit farm (formerly big mango exporter to Japan) and our neighbor was the orchard foreman. He worked part time for us and I Iearned a lot from him. My point is, if you are new to mango farming, and you're going to do a big commercial orchard operation like that, you need professional help, preferrably an experienced on-site orchard manager. (No I am not volunteering) Forum discussions may help, but first time growing something is always a learning experience, and with an orchard operation that big, mistakes could cost you your entire crop, or your trees. You are posting in the organic subforum, but a big mono-cropped tree farm like that would be very difficult to grow organically unless you really know what you are doing, and start with serious soil improvement, which can be a big investment in itself and requires some know-how. Mono-cropping a large farm like that is always risky. Without informed, proactive monitoring and preventive IPM, a pest or disease can get started and advance before you realize what's going on, and set you back big time. Your ideas of close spacing and heavy crown reduction pruning has advantages and disadvantages. Who will do the pruning and what will the cost be for that intensive maintenance. Cheap local labor that thinks they know what they are doing, may mutilate the trees and invite borer attacks and/or sunburn on stems that progresses into wood decay and structural failure. Hack and slash is a cheap way to go in the short term, but maybe not in the bigger picture for a permanent planting that should become more productive as the years go on. I don't like it and that's one reason I've never been that interested in commercial orchards, because I love trees and the natural form and beauty of trees. Manipulating nature and distorting natural form for intense commercial purposes is not my cup of tea. And also, as a tree maintenance specialist, I know too much about the downside and costs of working against nature. When you plant your young trees at the beginning of the rainy season, there will be a lot of open soil surface for you to grow a legume cover crop (green manure). This can be a cost effective way to incorporate soil organic matter and grow something beneficial instead of all weeds during the rainy season. To me the most important things, whether you are doing a chemical or organic program, are soil and water management. First get your irrigation program planned and equipment in order. Don't count on rain. If it rains great, you may not need to irrigate, but if it doesn't and you don't have an irrigation system, your crop may not develop adequately, or the worst case is extended drought and you lose your trees. Did you assess your soil for suitability for a mango tree crop? What was grown there before? Are your friends or other growers with mango orchards in the same area? Does the soil drain well, have you done a percolation test? Or is it former rice land that doesn't drain and will rot your tree's roots in standing water. If basically suitable land with well drained soil, get a scientific soil analysis and prescription for mineral amendments based on actual deficiencies found. This is a worthwhile investment. 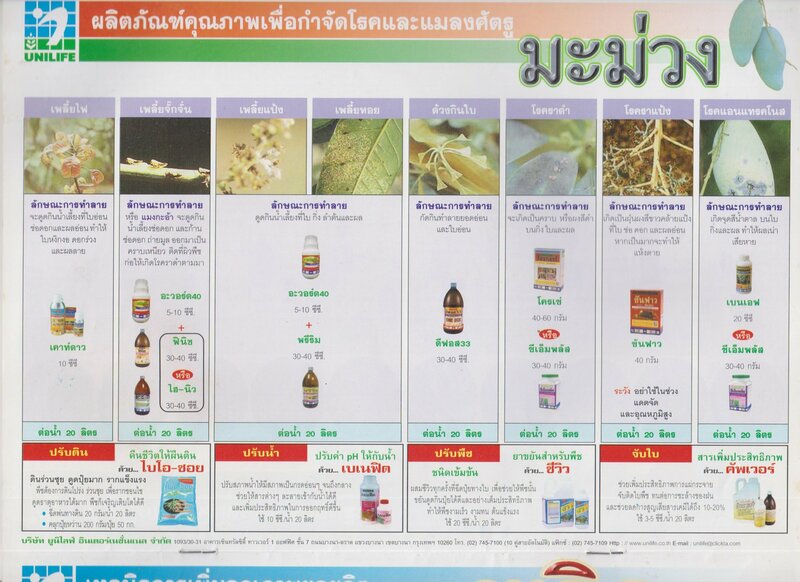 Most mineral products for basic corrections are available in Thailand, although some organic program materials I've had a hard time finding here. Amend the soil as early as this month or next, even before your trees go in. For 50 rai you will not be digging to incorporate the materials I assume, so search and get a quote for tractor rototiller or disking service. For a 50 rai operation you may want to buy your own. You can incorporate compost at the same time, or plan your green manure crop. We used jack beans and black beans, available for free at the time from the local Land Development Department. Seed at 5 kilos per rai, grow for 60 days/until flowering stage. rototill or disc before the the stems start to get woody. You can grow a cover crop every year, but once your tree absorbing root systems begin to extend, then it's better to go to "no-till" and just cut and leave lay as mulch. Speaking of mulch, get your sources in order, because you will want to mulch the soil surface right after planting. Rice hulls, rice straw and coconut fiber are all common possibilities. It helps to retain soil moisture, build soil organic matter and biological activity. Plant your trees high, or at least not too deep. Where the first roots flare off the trunk is called the root collar; that should be at soil grade or a little above. I recently dug up a young mango tree that our landlord had planted too deep and it was stunted, I believe due to hypoxia, lack of oxygen to the trunk conductive tissues. Roots should be below soil grade, trunk tissue above grade. I replanted at a higher level and it's doing better already. Don't let workers pile up soil or mulch against the tree trunk. OK there's my two satang for starters, some general info off the top of my head. But I'm not really the experienced commercial grower support that you need for more detailed advise. Above, you have some excellent technical advice. Here's some practical advice from personal experience. To be successful financially, (make a real profit) you will need to induce fruiting twice a year. Planting close and keeping canopies small is a good idea but high maintenance & needs lots of skilled workers to combine fruit pruning with canopy management. Such workers are not easy to find. Village style slashing will not do it. After planting; the first few years, remove flowers, give the trees a chance to get established. If you are looking to export, think about bagging, doable but again very labor intensive. Have your integrated pest & fungal management ready to go before you plant.. Forget about jackfruit, if your soil & climate is suitable, plant Durians. Excellent cash crop & delicious to eat. Good luck, fell free to ask specific questions.